This book builds on StrengthsFinder 2.0 and identifies three keys to being a more effective leader: knowing your strengths and investing in others’ strengths, getting people with the right strengths on your team, and understanding and meeting the four basic needs of those who look to you for leadership. This is a collection of John Gardner’s writings about leadership and it represents perhaps the clearest thoughts on leadership available in press. John Gardner was decades ahead in his thinking about leadership and his writing leaves an enduring legacy of valuable thinking and compelling ideas. Large parts of On Leadership appear in the John Gardner leadership collection Living, Leading, and the American Dream, but On Leadership is still well worth reading for the unique material it contains. 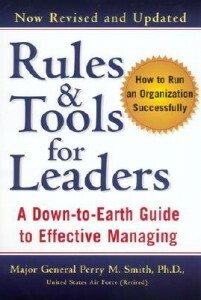 Every page of this book rings with the leadership insights and practical advice that made On Leadership a classic text. This is a straightforward book about leadership effectiveness by a duo that has been writing and thinking about leadership for decades. The advice they give is immediately implementable, forthright without being preachy, and based on years of combined leadership research and experience. the two books, the reader can extract plenty of ideas for forging an effective personal leadership style. Perry Smith’s book is filled with practical leadership advice and multiple checklists to improve the reader’s leadership effectiveness. If you are looking for a book full of actions to improve your leadership success, Rules and Tools for Leaders is a great place to start. This classic book, written by a former CEO of Avis, will have you laughing one minute and taking notes the next. Although written over forty years ago and focused on the best way to run a company, Robert Townsend’s book is filled with leadership guidance, insights, and strategies that can help leaders in almost any environment, from corporations to nonprofits to civic organizations. The Bass Handbook is the gold standard for separating leadership opinions from scholarly leadership findings. This is a dense academic handbook, but it is a required reference if you need to determine what the research literature says about virtually anything related to leadership. This relatively thin academic textbook does a great job of summarizing the most prominent scientific theories of leadership. Earlier editions are usually available at a steep discount and are more than sufficient as a reference for academic theories of leadership.